Lots of boats here at Ynysarwed Farm, Resolven in South Wales. 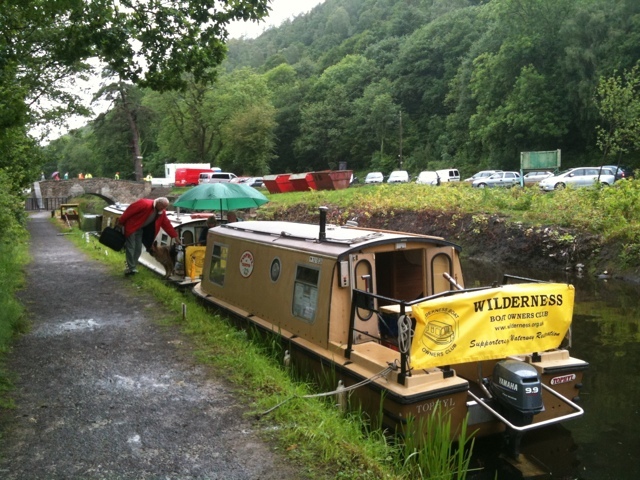 First impressions are a really well organised event, with boaters needs all catered for even a temporary 30mph speed limit covering the entrance to the site and the slipway. It’s a shame they couldn’t organise the weather as the Saturday morning dawned with misty rain after a glorious Friday afternoon. The sun is out!!! 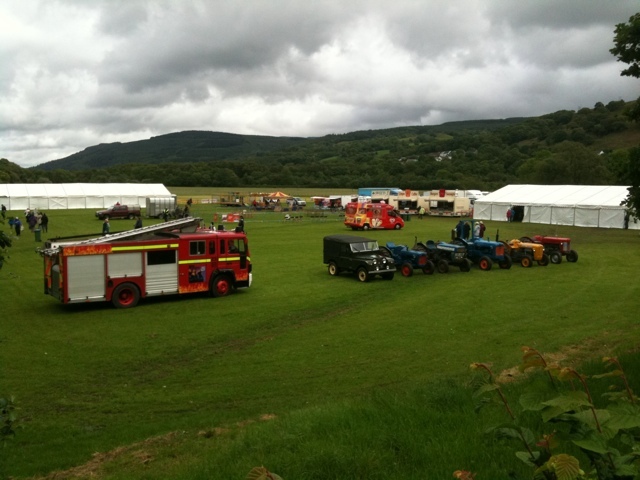 The rain stopped at around 11.30am and people stared to arrive. The band is playing, sheep are being rounded up in the pen AND outside, when they escaped and model planes are flying and all this after the event was officially opened. Lots of gongoozlers on the towpath this afternoon. At 6pm the WBOC AGM was held as arranged at last year’s notices and as sent out in the agenda to members. John Parker was elected as Chairman, filling the vacant post left by the sudden death of Keith Hadden, our long standing Chairman, in November last year. The reports from the officers and members of the club had been circulated earlier and were accepted. 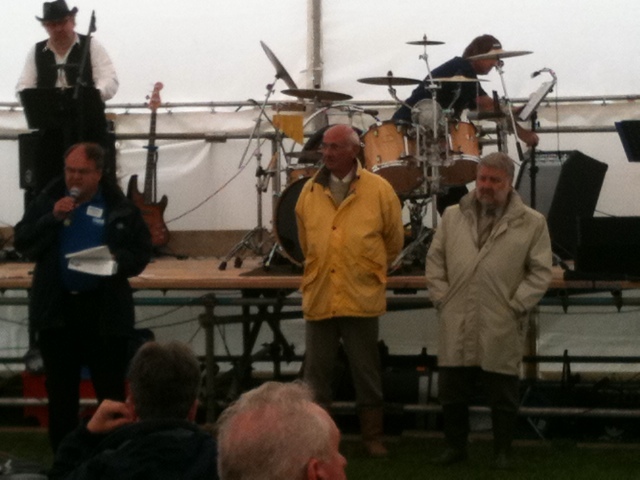 The committee was unopposed, were all happy to stand again and so were re-elected on block. The proposals for memorials in memory of Keith Hadden were accepted unanimously. The awards were presented as follows: The top trophy proposed by Keith Hadden to Beryl and David for entering whole heartily into the spirit of the 2010 national trailboat festival. The bottom trophy proposed by Sandra and given to John for getting stuck in the mud on the Hudderfield canal. The best illustrated article to Jane Pilgrim for an article on 2010 Easter trip to Liverpool. 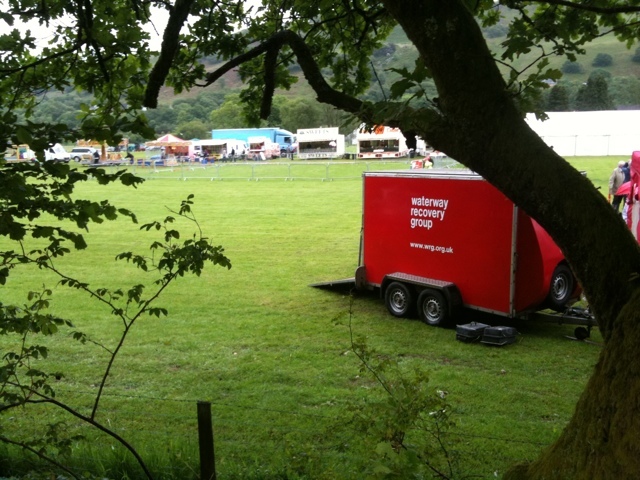 This was followed by a short talk by Chris Myers on the industrial heritage of the valley within which the festival was taking place and his families connection to it. 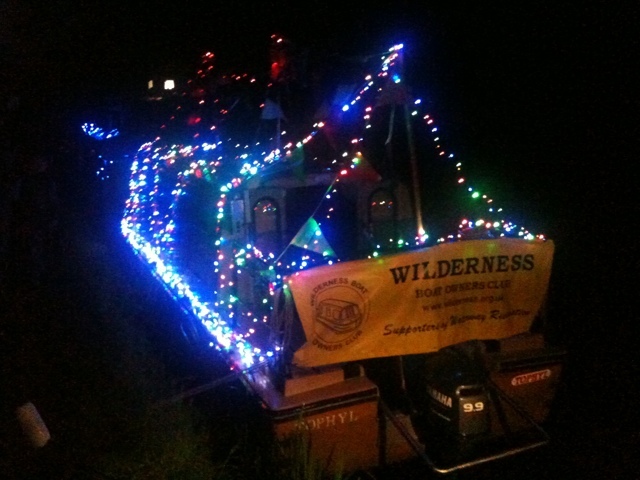 The next AGM will take place at the next IWA trailboat festival at Stroud next year. An evening of entertainment topped off the day in the tent with spirited singing of the Tonna Male Voice and Vintage Wine. Another wet night, with rain sweeping the site. So dispiriting for the organisers who have worked so hard to make this a really good event. We cannot praise their organisation high enough so far. We are told this weather is normal for Wales and the locals will take it in their stride. So if you are in the area, come to the site, take a boat trip and see what it is all about. Time to visit the other end of this restored canal. 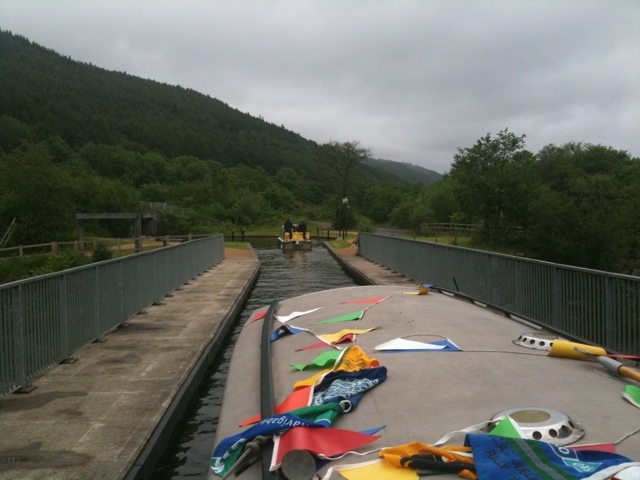 With the rain slowing, we left the festival site along with some competitors for the boat handling competition to travel down to Neath. 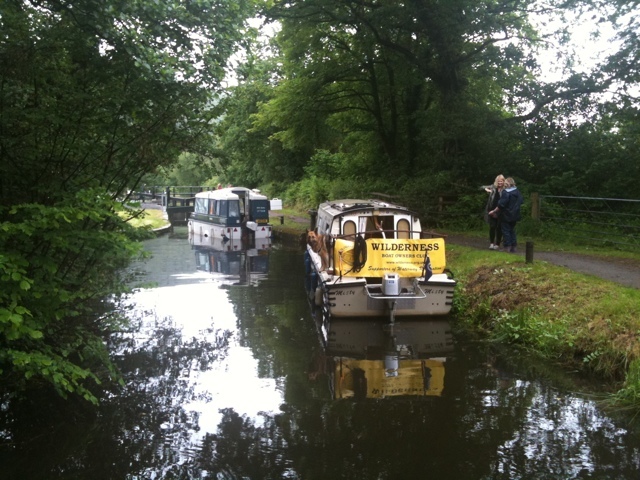 At the first lock we ran into a queue, which must be something of a rarity on this canal! 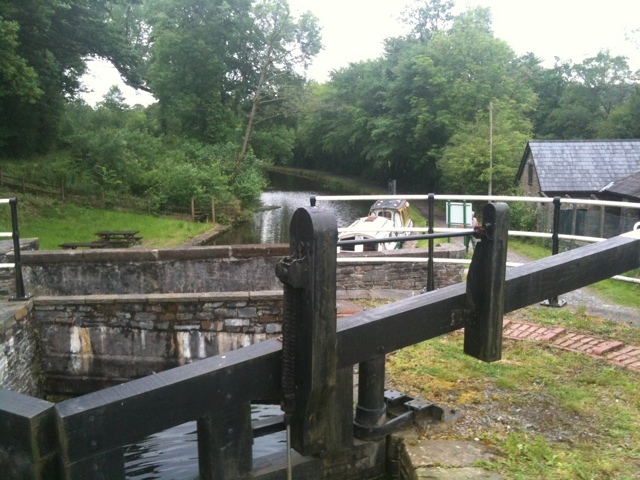 Locks in good condition, lovely scenery, plenty of water. Only some of the bridges air draft is a little challenging especially the one at the tail end of the 4th lock down. VERY TIGHT!!! 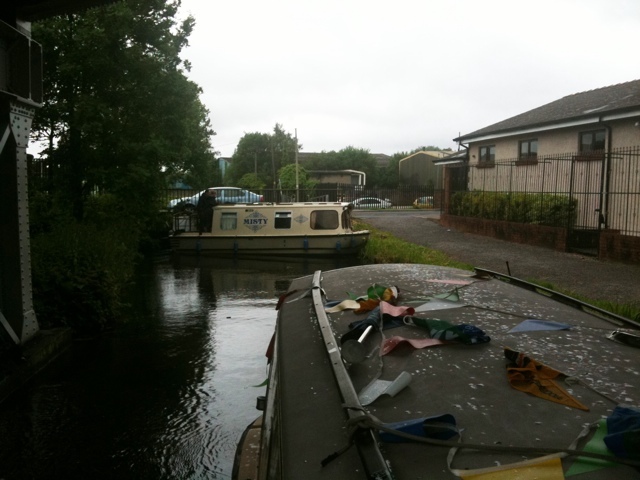 Past the junction to the Tennant canal and on into Neath. Past Morrisons and right to the road that blocks the canal. Take a few pictures then some shopping and back to the festival site. 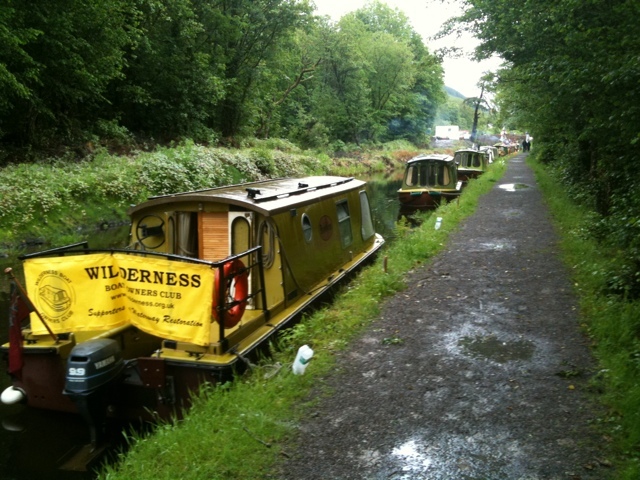 On the way back passed 6 more boats that had made there way to Neath. Nearly back to the festival when the rain started again as we passed over the longest single span aqueduct in the country. 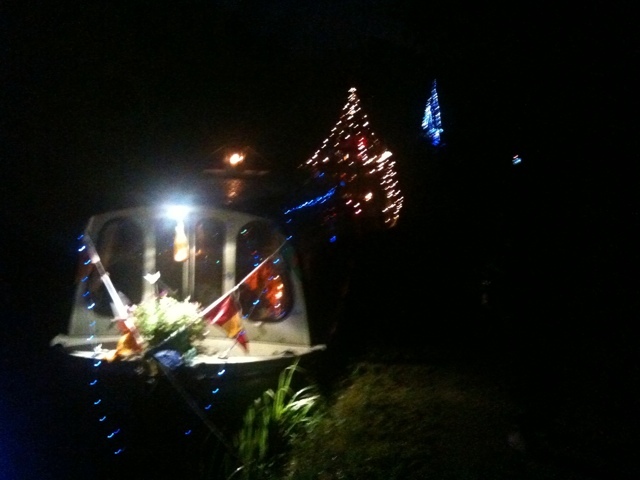 Then it’s time to put up the lights for the illuminated boat show that was well visited despite the rain that continued to fall and carried on throughout the night.